Wyatt Earp is a fixture in American folklore. His dust up at the O.K. Corral is legendary, and dozens of books have been written about both the shootout and the man. On the other hand, almost nothing has been written about his common-law wife, Josephine, and what little has been published is inaccurate. For example, “I Married Wyatt Earp” by Glen Boyer and published by the University of Arizona press in 1967, more than two decades after Josephine’s death, was withdrawn in 1998 because many of the so-called facts in the book could not be proven. Josephine, or Sadie as she was known to her friends, or Josie to Wyatt, was born in Brooklyn just before the Civil War. When she was 11, the Marcus family moved to San Francisco, where her father Carl-Hyman found work as a baker. Eventually, Josephine found her way to Tombstone, Ariz. 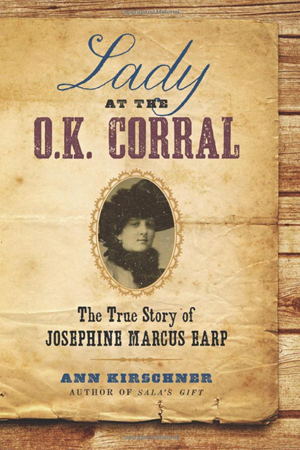 There Josephine met deputy sheriff Johnny Behan, and less than eight months after they built a house together, she left him for Wyatt Earp. How Josephine and Wyatt met and exactly when they moved in together is not known with any accuracy. The fact is they did, and they continued to be a couple for almost half a century. The festering bad feelings between Earp and Behan erupted on Oct. 26, 1881, at the O.K. Corral. It was one of the most famous gunfights in the history of the Old West. Acclaimed author Ann Kirschner chronicles the never-before-told story of this German-Jewish woman from New York and how she worked as a part-time actress and dancer who connected with one of the most famous lawmen of the frontier West. She brings Josephine out of the shadows to at last tell her story, a colorful and spirited tale of ambition, grit, adventure and self-invention, all set against the exciting backdrop of the panorama of the West.